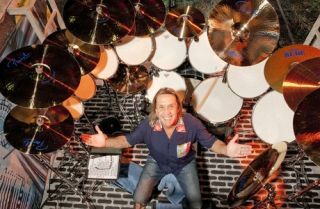 Nicko McBrain is set for a Premier UK clinic tour later this year. The Iron Maiden drummer will head to the UK in November for the An Evening With Nicko - A Night Of Drums, Drumming And Entertainment With Iron Maiden's Nicko McBrain run and we are proud to announce that Rhythm will be the tour's media partner. The run is also backed by Paiste and Remo. Nicko had this to say: "When Premier asked me to get involved with some design aspects on a new range of products, I was only too happy to oblige as I have the greatest respect for their workmanship and expertise. "Collaborating with Premier has been a tremendous experience and we hope you'll like the new ideas we've come up with! It's been some time since I've been out doing any drum clinics so I'm really looking forward to these German and U.K. dates. It'll be great to see some familiar faces again, and hopefully meet some new ones, too. "If you've never been before, come down and see for yourself what the evening's all about. I promise you it's a lot of fun and a great night out!" For more from Premier visit their website here.